You skied or snowboarded for most of your life, met a partner, settled down and had kids. For those first few years ski trips were put on hold but now that you feel the kids are ready you can’t wait to dust of the old skis and head to the slopes. But are the kids going to love it? It’s the biggest fear of parents around the world because if the kids don’t love skiing, it means you can forget about ski holidays for the next 20 or so years (god forbid!). Not to mention not being able to enjoy one of the best vacations you can have together as a family (ok we’re a bit biased). 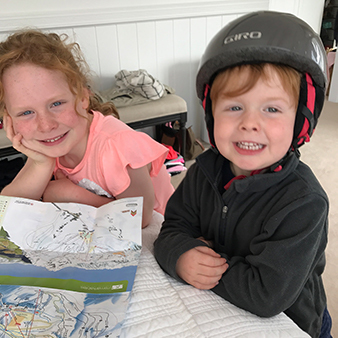 But fear not, for those who have booked or are considering a ski holiday with kids, we sought out some advice from two experts on how to get kids stoked on skiing - Aspen Snowmass Ski School’s, Director of Children’s Programs Sue Way, and Ski Instructor Ted Mahon. 1) Are there any tricks for getting kids excited for their first ski trip and is there anything parents can do before leaving home to make their first day on skis easier/happier? Sue: Parents should talk about how much they love to ski and how excited they are for the child to learn. If they have never seen snow before you can put an ice cube in their hand and talk about how the weather is going to different and they are going to have to wear more clothes. If you have your ski clothes the family can all get dressed a do a fashion show. Ted: The fact that the kids will be out of their real school and playing in the snow is often all that’s needed to get them excited. But it never hurts to show them a video of some kids skiing or even some clips of bigger kids going off jumps in terrain parks to get them pumped for the ski trip. 2) Should kids go into ski school from day 1 or is it better to get them used to the snow and equipment first? Sue: Children can go to ski school on the first day if they are well rested. If you are traveling long distances it would be best to get to the area, pick up your equipment, visit the ski school, and start the following day. Ted: Starting off in ski school will help ensure a solid foundation is set for the rest of the trip. 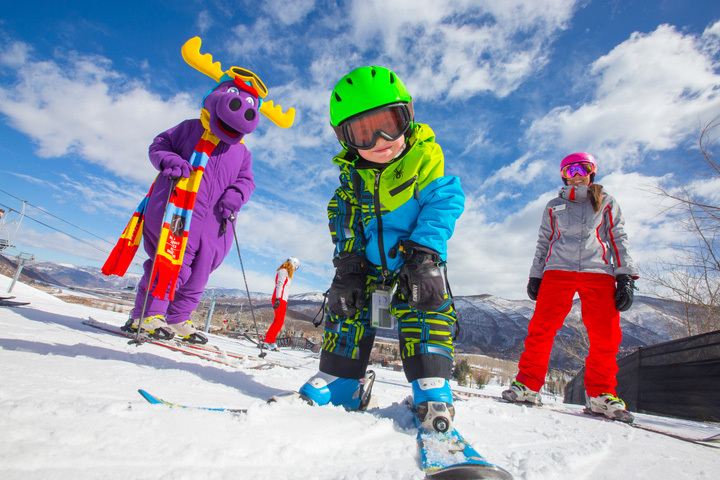 Familiarization of the equipment, safety awareness on the slopes and using the lifts, establishing or reviewing the proper way to ski will all help ensure the little ones have a good vacation and it will free up the day for the parents to get out on their own. 3) What is the first rule for making sure kids will be happy when heading out to go skiing? Sue: Parents need to keep a positive attitude and set realistic expectations of what their child is able to do on the first few days. If a child is going to have a difficult time with separation the parent needs to be willing to walk away when they are sad. Let the ski school know what your child needs are to feel comfortable. Bribery works well. Ted: The first rule for keeping kids happy is to make sure they are warm and comfortable. Skiing is challenging enough as it is, being improperly dressed for the weather and temperatures only makes things harder. 4) Do private lessons make a difference for beginner kids or are group lessons fine? Sue: Privates are awesome especially for children that are apprehensive, do not do well in large groups, and may have separation issues. Starting with a private is a great way to have your child feel comfortable and give them the opportunity to learn at their own pace. Children with confidence and can do attitudes will do great in group lessons. Ideally a combination of private and groups is the ticket. Ted: Kids are generally fine in group lessons. They’re often quick to make friends with other kids and they might find those interactions to be more fun than trying to talk to an adult all day in a one-on-one private lesson. 5) Can little ones (under 6) do a full day or is a half day of skiing and lessons enough? Sue: A half day is okay for the first day for children ages 4 & under and children in privates. If a child goes to group lessons and only take half days the child will lose the consistency of the group and more than likely have several different instructors throughout their stay. Ted: Kids under 6 can ski in a full day lesson, but some added attention should be paid to their energy level. They probably can’t ski as long without a break as kids a few years older than them. For that reason they should be in groups with kids of a similar age, and typically take some more breaks through the day. 6) Tantrums aren’t fun for anyone. Do you have any tips for parents whose kids are not having a good time out on the snow (whether in a lesson or skiing with parents). How do you re-set them and get them loving it? Sue: Start with low expectations. Make playing in the snow a game and not a task. Bribery works well, and games like a friendly competition to build a snow man, fill up soda cups with snow and make a mini hut for their favorite small toy. Children have a life time to learn how to ski. Parents need to be patient with the process. Ted: Tantrums might occur for a variety of reasons so there isn’t a single, simple solution. Sometimes kids are uncomfortable, they could be low on energy, they may not like the terrain they’re in and feel either scared or nervous. Instructors see it a lot and are usually good at reading the situation and able to determine the trigger. That makes it easier for them to figure out how to handle it. In most cases, taking a time out in the lodge, maybe over a hot chocolate, can help resolve it. Give them the choice to either ski some more after being inside for a bit and they almost always insist on heading back out. 7) What should people look for when choosing a ski school? Sue: It is important to find a school that hires Ski School staff that have past experience in working with kids and specializes in the age group of your child. For young children it is important to a have an inside facility with a beginner area that is in close proximity. Look for a program that has established age groups that are appropriate to enhance physical and emotional success and also a program that offers all levels of skiing at any age. Ted: Good facilities at the kids ski school can make a difference to a child. Just as an example, Ski & Snowboard Schools of Aspen have designed buildings at their base areas specifically for kid’s ski schools. 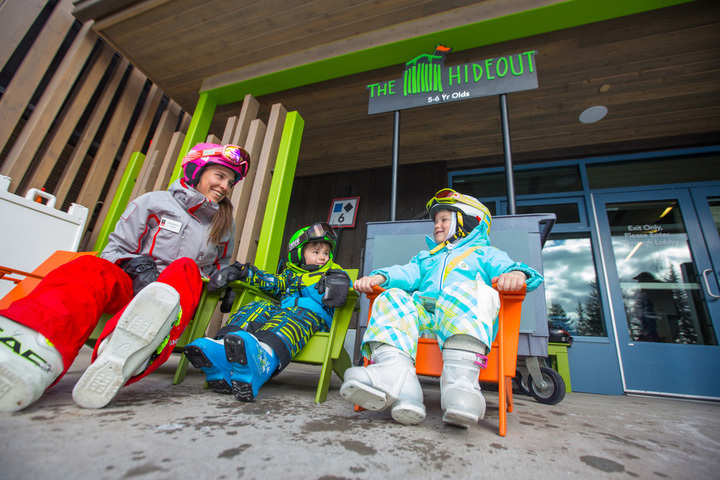 The Treehouse at Snowmass and the Hideout at Buttermilk are built to be fun for kids, with less serious, if not a playground feel, and it makes them happy to be there. Reasonable group sizes are important for lessons too, around 6 kids per group, so they can get the attention they need but still have enough other kids around to keep the experience dynamic. Choosing a ski area with suitable terrain for the children’s levels keep the skiing interesting for them as well. Sue Way is the Director of Children’s Programs at Aspen Snowmass Ski School. She is a certified PSIA Level 2 Alpine and Children’s Accreted instructor with a degree in early Childhood Education and has been teaching and running children ski schools for the past 30 years. Her mottos is that a “Family that ski together can count on a life time of family fun”. Ted Mahon has been a ski instructor at Aspen Snowmass for 21 years with more than a decade of that time spent with the kids ski school at Buttermilk Mountain. He was also nominated for 2016 National Geographic Adventurer of the year. 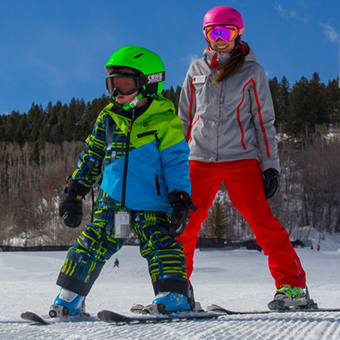 Group and private ski lessons at Aspen Ski School can be booked via Scout as part of an Aspen Snowmass ski package. Contact Scout today for a quote.